It’s still early in the season relative to the league’s non-waiver trade deadline at the end of July, so with the disclaimer that trade are still subject to change before then, Evan Drellich of NBC Sports Boston reports that the Red Sox “have an eye on” adding a reliever and a right-handed hitter to complement the team. Drellich points out that these types of additions would not mean “mortgaging” the team’s already-thin farm system, as the addition of a righty-bat would likely be an infielder to balance out the club’s lefty-heavy group. He also cites some troubling statistics about the usage and performance of pinch-hitters for the club, signaling that a backup plan for Dustin Pedroia could help the team in matchup situations. The veteran was seen as likely to resume baseball activities shortly after returning to the DL on June 2nd, but still has yet to be cleared for such activities three weeks later. Jon Meoli of the Baltimore Sun takes a look at the situation of Orioles outfielder Adam Jones, who’s enjoying one of his best calendar months in years. Per Meoli, Jones isn’t concerned about all the resulting trade chatter surrounding him. “I can’t let it bother me. I’m in a different part of my life to where I’m not anticipating a $150 million, $200 million, $300 million offer this offseason. I’m more just, ’Let me go be a pro, do what I do best,’ and that’s play the game hard and live with the result. All the other stuff, all the projections and this and that, that’s all whatever.” Notably, Jones is well aware that he “holds all the cards” in regards to where (or if) he’s traded, as the veteran’s been with the O’s long enough to qualify for ten-and-five rights. Speaking of the Orioles, Roch Kubatko of MASNsports.com takes a look at what the club’s infield (and roster) could look like post-Machado, if and when the veteran is shipped to another club. Kubatko notes that where fellow infielder Tim Beckham plays will depend upon whether or not the O’s get a major-league ready shortstop as part of the return for their superstar (if the don’t, Beckham seems likely to take over the position). In addition to all this speculation, Kubatko adds that Danny Valencia could see time at third in that case, but has also played himself into potential trade-chip status. Young Blue Jays hurler Aaron Sanchez left last night’s game with a finger contusion, Shi Davidi of Sportsnet.ca reports, noting that his departure throws a question mark into Toronto’s rotation. It’s not clear at this juncture whether Sanchez’ current finger issue is in any way related to the blister-related issues that limited him to just 36 innings last season, though reports of a contusion would seem to make that improbable. With so many moving parts on the Jays’ pitching staff, the Davidi wonders how the rotation alignment will shake out; there’s been some suggestion that Jaime Garcia could move to the bullpen with Marcus Stroman and Sam Gaviglio set to return from the DL and paternity list soon, respectively. Blue Jays fans have been anxiously anticipating the arrival of Vladimir Guerrero Jr., but they’ll have to wait a bit longer, as the 19-year-old phenom was placed on the minor league disabled list today after incurring a leg injury (link via Chris Bumbaca of MiLB.com). Guerrero went from first to second on a single, slid into the bag and immediately signaled for a trainer’s assistance before exiting the contest, though Fisher Cats manager John Schneider called the placement “cautious.” The team didn’t disclose further details on Guerrero’s injury, though all indications from the organization to this point seem to be that it’s minor. While the Jays have played Teoscar Hernandez more in right field than it left, it seems that he’ll move to left field on a largely permanent basis moving forward. As MLB.com’s Gregor Chisholm writes, the team feels that Hernandez has the arm for right field but that his range and instincts are better suited for the other corner slot. Randal Grichuk will likely get another shot to take the reins in right field, where he comes with a history of strong defensive ratings (career +9.1 UZR/150). Grichuk has gotten off to a disastrous start to his Blue Jays career, hitting .115/.202/.269 in 89 plate appearances, though Statcast gives some reason to be optimistic; Grichuk’s 99.1 mph average exit velocity on balls in the air and knack for barreling the ball have translated to a .318 xwOBA that dwarfs his current .209 wOBA. Right-hander Sam Gaviglio has been a rare bright spot in an otherwise dreadful season for the Jays, writes Arden Zwelling of Sportsnet. Acquired in a forgettable spring trade in which the Jays sent only cash considerations to the Royals, Gaviglio has stepped up as one of the club’s most consistent starters and has earned a longer look in the rotation. Through 28 2/3 innings thus far, he’s pitched to a 2.51 ERA with 8.2 K/9, 2.2 BB/9, 1.26 HR/9 and a 54.4 percent ground-ball rate. While it’s obviously a small sample and Gaviglio shouldn’t be expected to continue sporting a sub-3.00 ERA, fielding-independent metrics in that small sample are encouraging. Zwelling takes a look at the manner in which Gaviglio has found his early success. Of course, he also notes that the very fact that Gaviglio is poised to get any type of notable look in the rotation is a testament to the team’s struggles this season and the fact that things have hardly gone as planned. As the Jays struggle, trade chatter surrounding veterans on the club will only increase. J.A. Happ’s name has already begun to pop up on the rumor mill (FanRag’s Jon Heyman took a look at that earlier today), and if the Jays do deal from their rotation it could open the door for Gaviglio to get an even lengthier audition. J.A. Happ Randal Grichuk Sam Gaviglio Teoscar Hernandez Toronto Blue Jays Vladimir Guerrero Jr. The Blue Jays have acquired right-hander Sam Gaviglio from the Royals for cash considerations or a player to be named later, according to an announcement from Toronto. To make room for Gaviglio, the Blue Jays designated left-hander Matt Dermody for assignment, Shi Davidi of Sportsnet tweets. The 27-year-old Gaviglio lost his spot on the Royals last weekend, when they designated him to make room for newly signed reliever Justin Grimm. Gaviglio came to the Royals via waivers from the Mariners last September and closed the year by throwing 12 innings of four-run ball with KC. Between the two teams, Gaviglio racked up 74 1/3 innings across 16 appearances (13 starts) in 2017 – his rookie year – and posted a 4.36 ERA/5.81 FIP with 5.93 K/9, 3.15 BB/9 and a 49.4 percent groundball rate. With two options remaining, he figures to begin his Blue Jays tenure by serving as minor league depth. Dermody, also 27, has been a member of the Toronto organization since it used a 28th-round pick on him in 2013. He debuted in the majors two seasons ago, throwing three innings, and is coming off a 22 1/3-frame campaign. The results haven’t been great for Dermody, who has logged a 5.33 ERA/6.12 FIP despite playable strikeout and walk rates (7.11 K/9, 1.78 BB/9). A low grounder rate (37.3 percent) and a propensity for giving up home runs (2.49 per nine) have hurt his cause in the majors, though he has been considerably better at preventing runs at the Triple-A level (3.34 ERA, 6.8 K/9 and 2.4 BB/9 in 59 1/3 innings). 12:52pm: Grimm’s deal comes with a $1.25MM salary and up to $300K in performance bonuses, Rustin Dodd of The Athletic tweets. Those bonuses start at 30 games and max out at 55, per Jon Heyman of FanRag. 12:25pm: The Royals have signed right-handed reliever Justin Grimm to a one-year, major league contract and designated fellow righty Sam Gaviglio for assignment, Maria Torres of the Kansas City Star reports. Grimm is a client of the Bledsoe Agency. It wasn’t a long stay in free agency for Grimm, whom the Cubs released on Thursday. The 29-year-old had been in line to collect a $2.2MM salary, but the Cubs saved most of that money (minus $541K in termination pay) in cutting him. They deemed Grimm expendable in the wake of a rough 2017 that saw him pitch to a 5.53 ERA/5.36 FIP with 9.6 K/9, 4.39 BB/9 and a 43.1 percent groundball rate across 55 1/3 innings. Grimm’s run prevention issues were thanks largely to a 22.2 percent home run-to-fly ball rate, more than twice the mark he logged in Texas and Chicago from 2012-16 (10.5). 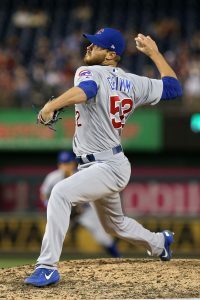 When Grimm was able to limit homers earlier in his career, he was a useful cog with the Cubs, particularly when he recorded a 1.99 ERA with 12.14 K/9 during a 49 2/3-inning 2015 campaign. The Royals surely aren’t expecting that type of production on the heels of his ugly 2017, but last year’s version of Grimm still offered good velocity and an 11.4 percent swinging-strike rate. That mark fell right in line with the overall figure he put up during his four-year Cubs tenure (11.9). He’ll now be part of a Royals bullpen that’s set to feature a couple other established relievers seeking bounce-back years in Kelvin Herrera and Brandon Maurer. Gaviglio, 27, joined the Royals on a waiver claim from the Mariners last September. He closed the season by throwing 12 decent innings in Kansas City, where he allowed four earned runs on 13 hits and five walks, with nine strikeouts. Between KC and Seattle last season, his first in the majors, Gaviglio tossed 74 1/3 innings (16 appearances, 13 starts) and registered a 4.36 ERA/5.81 FIP with 5.93 K/9, 3.15 BB/9 and a 49.4 percent grounder rate.